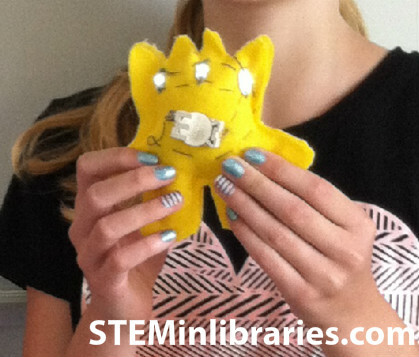 Brief Description: Learn how circuits work while creating a fun and whimsical stuffed animal. 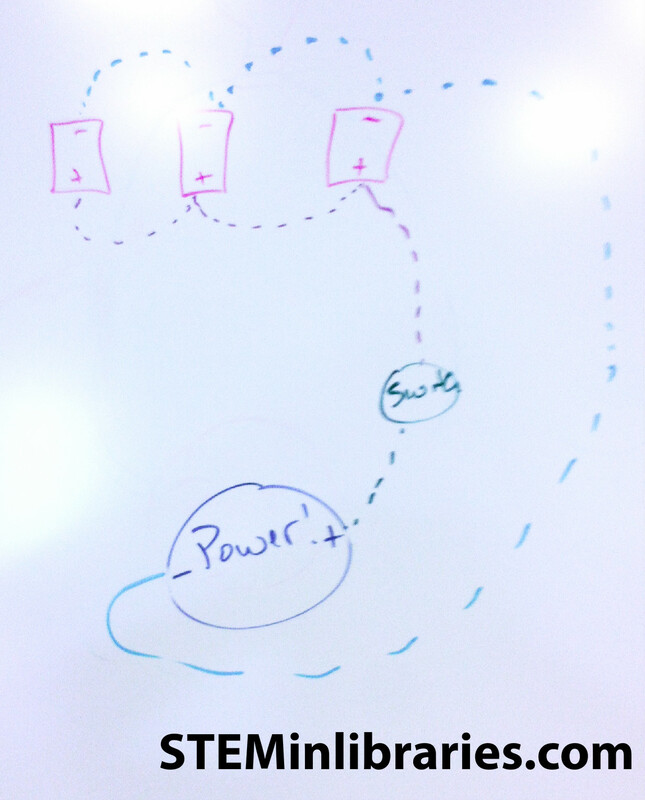 Explanation of how the sewable circuit will be laid out and work. Explanation of how circuits work. This site has a simple explanation; this site has explanations regarding different types of circuits; and this site is an in-depth explanation of circuits and electricity. Use paper, pencils, and printed templates to either create own monster, or use an existing design. 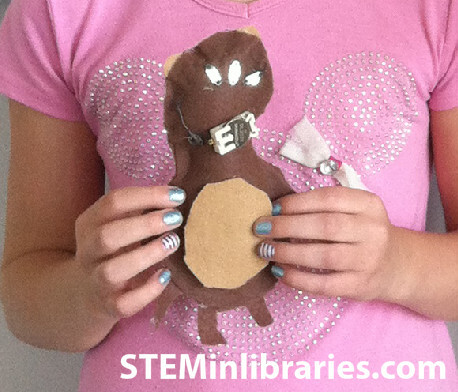 Cut designs out in felt; be sure to cut design out twice for both a front and back of the stuffed animal. Sew or hot glue stuffed animals partially closed, stuff with stuffing, and sew/glue completely shut. Link above outlines entire activity. In addition to the advice and procedure listed in the link, we found that threading wax helped keep the conductive thread from tangling. 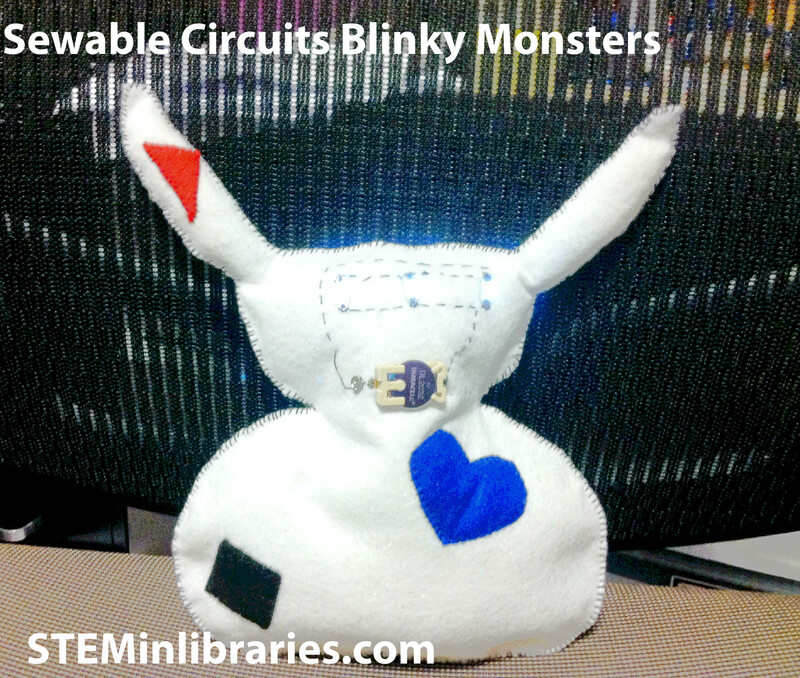 It was also helpful to have a completed Blinky Monster on hand to use as a reference when helping children plan their circuits, as well as drawing the circuit layout on our whiteboard as a visual reference. Due to time constraints, we helped the children finish their Blinky Monsters by hot gluing, rather than sewing, the monsters shut. We had baggies on hand if the children either wished to sew the stuffed animal together, or didn’t finish sewing their circuits, and needed to take materials home. Although we allowed for two hours to do this program, it could easily be a three hour program. Many of our 4-6th graders either did not know how to sew, or had very little experience sewing, therefore things took much longer than expected. For future programs, we plan on offering a sewing class beforehand, for those who would like to learn. Also, despite having a circuit drawn on the board for an example, it would be helpful to give each student a circuit handout as reference. For a younger audience, or as an alternate way to present this program to 4-6th graders, offer it as a family program. In this way, parents will be on hand to assist their child in the basics of sewing. We also found many parents fascinated by the idea of sewable circuits. The program, as is, would work well for a Teen program, without any adaptation.